The famous flashback show “The Sound of Drums” represents the early life of the Master, when he was precisely at the age of eight. For those who have not watched the show, the Master is the central character who possesses an exclusive handheld weapon which functions as a laser device. The weapon is very powerful and it can seriously harm the humans around the Master. This laser device has an ability to kill a man with a single shot. Due to that fact that it can kill somebody in a split second, this device is very dangerous for everyone who tries to oppose the Master. There are also some other evil features regarding this weapon. The tool can instantly change the age of a certain person only with a single shot; this change is based on a genetic manipulator which was developed by Professor Lazarus. Along with that feature, the device can instantly disable any other device no matter how powerful it is. 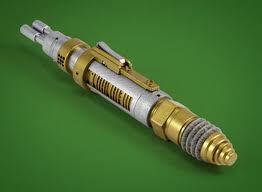 This potent device is called laser screwdriver and it is based on laser technology. It has a modern replica which looks like a toy and it can be bought for nearly $30. The toy is originally designed as a replica of the original device and it has the same authentic features, such as recognizable sounds and effects. Also, the screwdriver toy can be extended by simply pushing a button. The laser works thanks to the three AG13 batteries. With a single push of a button the original (imaginative) screwdriver will release a lethal beam of yellow laser energy and will do a real damage, but the replica will release only a yellow laser rays which in no case will kill a man or change their age.